Jack Owens was originally from Broken Hill. He was a prolific left footed full-forward who excelled despite playing much of his career in what was then the League's weakest team. 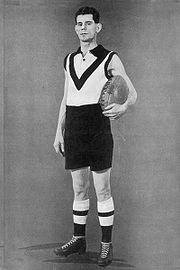 He favoured the screw punt when he lined up for goals and it was effective as he topped Glenelg's goal-kicking every year from 1924 to 1932 as well as for a tenth time in 1934. On three of those occasions he was the league's leading goal scorer, outright in 1927 and 1928 with 80 and 83 goals respectively while he tied for the mantle in 1932 with Ken Farmer on 102 goals. Towards the end of his career Glenelg began to improve and in 1934 he captained the club to their inaugural SANFL premiership. He was also South Australian captain for interstate matches in 1933 and 1934. In all he appeared for his state team on nine occasions and kicked 26 goals. This page was last modified on 5 January 2018, at 04:07.